Unexpected | Let's Play Speech! Emiko Hori is the author of Let’s Play Speech! 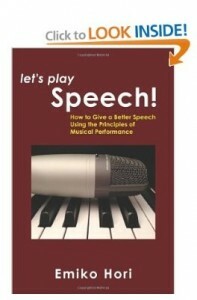 – How to Give a Better Speech Using the Principles of Musical Performance, available on Amazon. Speaking of mishaps, what do you suppose I do if I forget a note during my piano performance? I just move on. The performance should be flawless, just like riding on a moving escalator from the first floor to the second floor without stopping. There is no going back. As long as I am musically correct in terms of interpretation, I will succeed in engaging the audience despite a few missed notes. Usually, the audience is forgiving about a small mistake or two, or may not even notice you missed the notes. By the end of the performance, they will usually forget them. On the other hand, if I am not musically correct and I’m not engaging the audience, they will spot my flaws right away. I forget the first line of my speech? The audience doesn’t laugh at my punch line? I forget to bring my prop? I accidentally drop my prop during the presentation? I cannot take my hat off my head during the speech (assuming that my hat is my prop)? I cannot find a table to place my hat (or any of my props)? My PowerPoint does not start? The room is too hot? My microphone does not function? The room has no microphone? An audience member’s cell phone rings? The stage makes noise when I walk around? During the preparation, it is ideal to make a mental note (or write them down if you want to be totally sure) of what to do in every one of the scenarios above. These are called “planned” spontaneous actions. It is like a fire drill. Keep a mental note in the back of your mind, and use it if necessary. We all hope that nothing unexpected happens on stage. If something does happen, well, you are ready to take alternate action!